LA Meds 4 Less is actually not an online pharmacy, but a physical store located in Los Angeles. Instead of carrying medicines, this store is selling all kinds of Cannabis, or marijuana, as most of us know. In some states in the US, medical marijuana is legalized, but in some locations, the use of marijuana, even for medical conditions, is still illegal. There is much controversy when it comes to the use of Cannabis in the medical field because the plant has much potential for abuse. According to online sources, the use of marijuana in the United States is legal in more than half of the states. However, the Food and Drug Administration has still yet to approve its use in patients due to lacking evidence (studies) for its safety and effectiveness in the patients. Although there are a plethora of research agencies that could study Cannabis, one roadblock to getting research done is the present drug status of marijuana. Presently, marijuana is considered a “Schedule I” drug and is classified amongst the likes of LSD, ecstasy, and heroin. Schedule I drugs like marijuana have little potential for therapeutic use and have more potential for abuse. Due to the present marijuana class, researchers need to produce special licenses to purchase it before they can scrutinize it, which makes it difficult for researchers to produce studies that can change marijuana’s present drug status. Despite the present drug status for marijuana, most of the US states have legalized its use due to its benefits. Marijuana plants contain what we call as “cannabinoids”—more than a hundred of them—which each have varying effects on the body. What researchers are most interested in are the THC (delta-9-tetrahydrocannabinol) and CBD (cannabidiol) in marijuana that yield the therapeutic effects. However, besides being significant medically, THC is also the substance that gives the feeling of getting “high” in users of recreational marijuana. Although the other states have not yet fully legalized marijuana, some of them allow for restricted use. Some of these states are Iowa, Louisiana, Mississippi, Missouri, South Carolina, and Utah. What is LA Meds for Less Slo? LA Meds for Less is one of the medical marijuana dispensaries in California. It is operating legally in the state since California is one of the states where medical marijuana is legalized. Apart from selling marijuana products, LA Meds for Less is also a vape shop. Although the store does not have its own website, customers can view the store’s profile through websites like Yelp and Weedmaps. Consumers interested in purchasing medical Cannabis can find LA Meds’ address and phone number on Yelp. Are LA Meds for Less and Weedmaps the Same? LA Meds for Less and Weedmaps are not the same—LA Meds for Less is a physical store for medical marijuana, while Weedmaps is an online “shopping” site for patients/individuals with the need for medical marijuana. Weedmaps is like Amazon, but for weed. The site features a search engine which consumers can use to search nearby dispensaries of medical Cannabis products. The website also allows online orders for Cannabis, through participating ground stores. The pick-up and delivery services depend on the location of the buyers. Only consumers located in marijuana-legalized states may use the service. Weedmaps is also restricted to buyers aged 21 and above. 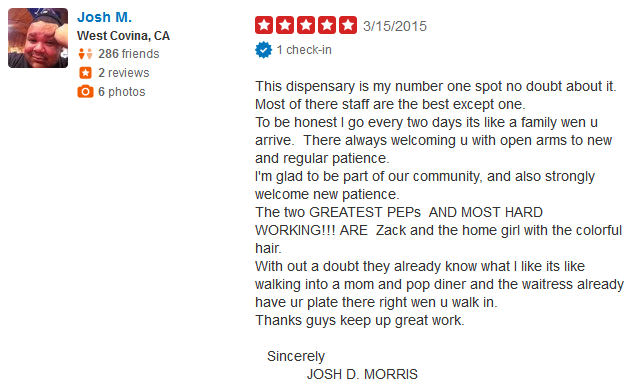 Josh M rated the store 5 out of 5 and mentioned that the LA Meds for Less dispensary was his “number one” spot. According to him, all of the staff at LA Meds for Less were great (except for one). He was certainly fond of the store and mentioned that he was comfortable enough dealing with the shop for his needs. Pam S from New York, on the one hand, rated the shop only one star out of 5. According to him, he’ll give the store zero stars if she should and mentioned that the store declined to serve her because she was from another state. She emphasized that the store should train its employees to be more accommodating. Dr. Bill B. rated the store 4 out of 5 points overall for its service and products. The only thing that kept him from rating the shop excellently was because the store was “out of the way” and took him an hour via train. LA Meds for Less is a physical store selling medical marijuana in California. Medical marijuana in California is legal, but the use of Cannabis is still legal in several of the US states. More studies are still needed to establish the benefits of marijuana through more studies on its medical use.